Brands are comfortable and familiar with pushing messages via social channels. However, pulling insights from what customers are saying there isn’t as common, and uncertainty remains about its value. But with the right tools and queries, social listening can reveal the knowledge needed to make actionable business decisions. Using social data isn’t a new concept, but confusion remains about how to best use it and there is low adoption from brands that are more passive or less sophisticated in their approach. Many brands, for instance, still find it difficult to find the right conversations, ask specific questions of the data and operationalize the findings. Social listening goes beyond social monitoring. Monitoring, the more basic and passive technique, occurs on a brand’s owned social channels. Listening extends to social media conversations that may not mention the brand directly but are still relevant. 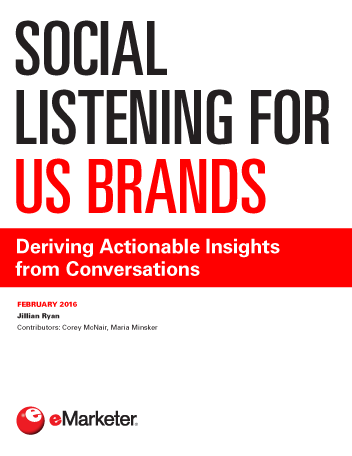 eMarketer has identified nine use cases in which social listening can help brands derive actionable insights. These fall into two main categories: improving marketing and selling, and learning from consumer feedback. Brands need to ask the right questions to unearth useable information. Keyword queries and filters are the cornerstone of social listening technologies. But more advanced approaches, including image recognition and machine learning, are emerging features of the social listening technology stack. "Forty-nine percent of marketing executives in North America polled by the CMO Council and Pegasystems in Q4 2015 used social listening resources to better understand their customers, prospects and markets." The Social Data Divide: Is Anybody Listening?